If you launch ReclaiMe Pro for the first time, a window appears where you should enter your license key, either trial or active. Then, every time your start ReclaiMe Pro, the Licensing and updates window appears. 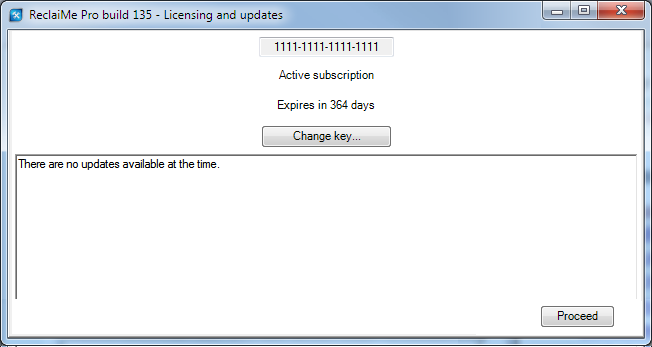 At the top of the window the current license key along with its status (trial, active, or expired) is displayed. You can change the key any time by clicking the Change key button. Note that ReclaiMe Pro requires internet connection to operate. If there is no internet connection the software cannot start and gives you an error message. Until you provide a valid license key, ReclaiMe Pro doesn't work – the Proceed button is inactive. In the center of the Licensing and updates window, information about all the available updates along with download links are listed.